High cholesterol levels in the blood increase the risk of various diseases, such as strokes and even heart attacks. Eating walnuts on a regular basis has proven efficacious for lowering cholesterol. In addition, the content of amino acids and omega 3 fatty acids in walnuts has an anti-inflammatory function and also prevents the formation of blood clots. All types of nuts, including walnuts, are associated with a reduced risk of developing diabetes. Based on research, women who consumed 28 grams of walnuts twice a week, had a 24% lower risk of developing type 2 diabetes. In addition, for people with type 2 diabetes, consuming walnuts regularly is also beneficial for reducing blood sugar levels. Bone loss or osteoporosis is a common disease that occurs with age. To help bones stay strong and healthy until old age, consuming walnuts can be an option. Walnuts contain fatty acids called alpha-linolenic acid or ALA. Based on research, ALA has the benefit of maintaining bone health and strength, and helping bone formation. Frequent practice of insomnia or difficulty sleeping at night? Try to make walnuts as a snack. Walnuts contain melatonin, a hormone produced by the body with the function of regulating sleep cycles or circadian rhythms. Because melatonin has been produced by the body, consuming walnuts means adding melatonin levels in the body which results in drowsiness. Consuming walnuts regularly makes the skin look younger, healthier and shinier because of its vitamin E content and antioxidants. Besides being eaten, walnuts can also be used as a scrub to remove dead skin cells. The way is by mashing (or can also blender) walnuts, mix with honey and stir. You can also add other ingredients such as olive oil or lemon juice for better results. After that apply evenly on the face, wait for 15 minutes then massage the face in a circular motion for three minutes, then rinse with warm water. Want to lose weight but a hobby of snacking? Walnuts can be a snack choice for those of you who are on a diet program. In addition to its ability to increase the body's metabolism, eating just a little walnut can make your stomach feel full. A full stomach will reduce your appetite and will help you regulate your weight. If stress has begun to interfere with your health, then now is the right time to eat walnuts. 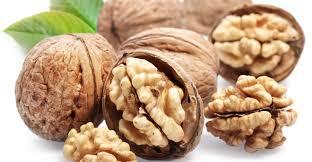 Researchers found that eating nuts and walnut oil can reduce blood pressure which is a response to stress. In addition, other ingredients in walnuts such as fatty acids and omega 3, are nutrients that make effective walnuts to overcome stress. The brain is one of the vital organs in the body, therefore we should maintain its health. One of the right ways to maintain brain function is by consuming walnuts. As mentioned before, walnuts contain a lot of omega 3. By consuming walnuts, we can prevent the emergence of diseases related to brain function such as Alzheimer's and dementia. Have dry and irritable skin? Don't worry, these things can be overcome with walnut oil. The trick is also easy. Before going to sleep, apply walnut oil to the face evenly, then massage the face gently. Leave it overnight and rinse the face with warm water the next day. To get moist and smooth skin, do this every day for a month. Although small in size, walnuts have enormous benefits if consumed by pregnant women. The high content of omega 3 in walnuts helps the formation of the fetal brain, retinal formation and also helps the growth of the nervous system. While the fatty acid content in walnuts can reduce the likelihood of babies experiencing food allergies later. Postpartum baby blues is a form of depression experienced by new mothers. Baby blues cause the emergence of various emotions such as excessive anxiety, mood changes, and insomnia. Usually baby blues are diagnosed two or three days before giving birth and can last for several weeks. Consuming walnuts has been widely recommended by medical practitioners, because the content in walnuts is believed to help overcome baby blues. One of the causes of hair loss is vitamin B7 deficiency or commonly referred to as biotin. This can be prevented by consuming walnuts that are rich in vitamin B7. Walnuts also contain various components such as omega 6 fatty acids, zinc, and iron which are known to be important for hair growth and prevent hair loss and strengthen hair follicles. Not only consumed, walnuts can also be used as an oil that is equally beneficial for the body. One of them is nourishing and accelerating hair growth, as mentioned earlier, walnuts contain various substances that are important for healthy hair. The trick is easy, just apply walnut oil to the scalp and do a light massage for a few minutes and rinse with warm water. Aside from being incompatible with shampoo or other hair products used, one common cause of dandruff is dry scalp. Walnut oil is known for its ability to moisturize it so it is often used as a mixture in hair oil. So it is not wrong if walnut oil is touted as a natural anti-dandruff ingredient. Having a panda eye and a large eye bag is very disturbing. To overcome this, you can try to apply walnut oil regularly in the area around the eyes. In addition to removing panda eyes and eye bags, walnut oil is also efficacious to relax the eyes and make the skin look radiant. This is nothing but not because of the high antioxidant content of walnuts. Although it has various benefits, excessive consumption of walnuts is also not good. One side effect is to cause kidney stones due to oxalate content, a chemical that causes the formation of small crystals. Simply consume 1.5 ounces of walnuts per day to get the benefits.